The Gaia spacecraft was launched from Kourou by a Soyuz-Fregat launcher on 19 December 2013. The Launch and Early Orbit Phase (LEOP) has a typical duration of two days. Initially the Fregat-Gaia composite was placed on a parking orbit, after which a single Fregat boost injected Gaia on its transfer trajectory towards the L2 Lagrange point. LEOP was followed by the transfer and in-orbit commissioning phase, during which all operations that were necessary to prepare for the operational phase were performed. In particular, all science driving functions were thoroughly tested and calibrated, including micropropulsion and payload. This phase included the insertion into the operational orbit around L2 and any eventual orbit correction manoeuvres. Following final commissioning and calibration, the spacecraft was ready to enter the 5-year long operational phase, which may be extended by one year. Gaia operates in a Lissajous-type orbit, around the L2 point of the Sun-Earth system, which is located 1.5 million km from the Earth in the anti-Sun direction. The orbit is not impacted by Earth eclipses. The orbit period is about 180 days and the size of the orbit is typically 340 000 × 90 000 km. This location in space offers a very stable thermal environment, very high observing efficiency (since the Sun, Earth and Moon are behind the instrument field of view) and a low radiation environment. Uninterrupted mapping of the sky takes place during the operational mission phase. 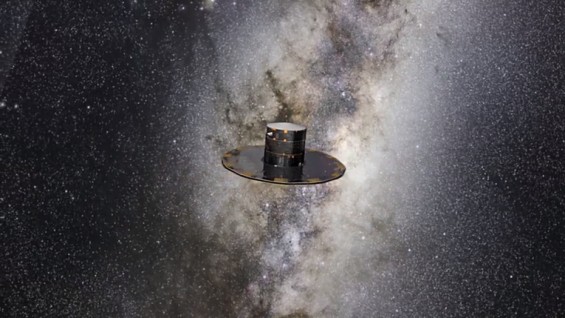 Gaia builds on the global astrometry concept successfully demonstrated by the Hipparcos mission. This measurement principle relies on the systematic and repeating observation of the star positions in two fields of view. For this purpose, the spacecraft is slowly rotating at a constant angular rate of 1° per minute around an axis perpendicular to those two fields of view, which therefore describes a circle in the sky in 6 hours. With a basic angle of 106.5° separating the astrometric fields of view, objects transit in the second field of view 106.5 minutes after crossing the first one. The spacecraft rotation axis makes an angle of 45° with the Sun direction. This represents the optimal point between astrometry requirements – that call for a large angle – and implementation constraints, such as payload shading and solar array efficiency. This scan axis further describes a slow precession motion around the Sun-to-Earth direction, with an average period of 63.12 days. This allows the scanning law definition to be independent from the orbital position around L2. In some regions of the sky, like Baade's window, Omega Centauri or other globular clusters, the star density – about 750 000 per square degree – exceeds the storage capability of the onboard processors. In these cases, a modified scanning law may be temporarily followed to increase the number of successive transits in these regions.